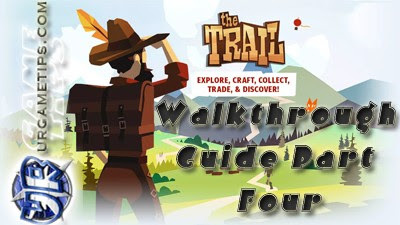 Here's the 4th part of our quick walkthrough guide and tips for beginners playing "The Trail" (Android and iOS mobile game). - I recommend that you follow our previous guides first for other tips that I will no longer mention here. - Explorer > Bufallo Pie Recipe (craft or buy, If you were able to save 27 Wheat Grass (part 3 of our guide), this should be easy). - Explorer > Marshall Hat Recipe (go and buy from the Sunny Savanna or Deadman Dunes ferry camps, but if you want to craft, hunt Rabbit Felt from the Pine Fields region: Leafy Grove > Waterfall View; or Waterfall View > Green Site. Vultures Feathers can be found from Sunny Savanna and Deadman Dunes region, choose any short trail you like or buy from traders). - Go to Sailsbury region - Swampfire Landing or Woodland Walk region - Wetland Way. Buy all Cotton Fibres (for crafting) and Twines from other traders. - In-case you didn't earn them before, go to Deadman Dunes region - Baked Boulder > West View. Collect all Desert Rose you can find and also pull those 2 Raccoons. Once you reach the 2nd raccoon, force close the game then restart. Check the shops too if you are lucky. - Gather as you go through Green Maze region and Lava Mountain region (early trails). If you need to farm more, just run through Green Maze region - Primeval Wilderness > Hot Spot +3 Raccoon pulls, or force close after getting your 2nd pull. - Craft, pull from Raccoons, or get from other sources. I suggest you pull these items from Raccoons since you need a lot to complete this quest. Go to Green Maze region - Primeval Wilderness > Hot Spot to find 2 Racoons near the camp. Once done, force close the app then repeat. - Just hunt boars along the way or craft your extra Boar Fur Scraps. - Best collect them from pulling Raccoons (Green Maze region - Primeval Wilderness > Hot Spot). Force close app then repeat. Do not use your hard earned Food. - Same, best collect them from pulling Raccoons (Green Maze region - Primeval Wilderness > Hot Spot). Force close app then repeat. - Buy from other Traders (common item), or pull from Raccoons as you go along the trail. - Just chop them along the way or craft your extra Mesquite Logs or Sticks. - Best collect them from the ad girl Annie, or by pulling Raccoons as you go along the trail. Do not use your hard earned Food, buy them from other traders if you need more. - Note: If you can't find any raccoons from the Falling Leaves region, rush through the next region. - Start buying Ice from other traders once you reach the Falling Leaves region (optional), but rush through the next region until you reach the Glacier Vale region. - Glacier Vale region will start to drop these items. Collect and complete this quest as you go. - Common item from trades, but if you are saving Chits, go and just pull them from raccoons as you go. - Craft, buy from other traders, or collect them from pulling Raccoons (Green Maze region - Primeval Wilderness > Hot Spot). Force close app after reaching the 2nd raccoon then repeat. - Best collect them from pulling Raccoons (Green Maze region - Primeval Wilderness > Hot Spot). - Just collect and complete this quest as you go along the trail. - End of Part 4 Quick Walkthrough Guide Quest List. - If you can still craft Cookies, that's good, but if you don't have any Apples, just use your Wheat Grass to craft Bread. - Continue and gather Rock Salt and Raw Meat along the way or from trading for your Jerky recipe. - You should have lots of Eggs by now, use them to craft Omelettes. - Buy some Omelettes, Sausages and Peach Cakes from other traders and keep them as your backup Food for future game content. Buffalo Pies are also available but it's too big to carry. 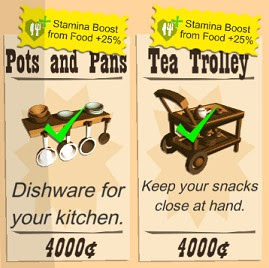 - Upgrade your House to Lvl 5 (requires LumberYard building to get planks) and purchase the 2 furnitures that gives "Stamina Boost from Food +25%". - Keep the number of your character's Hearts to at least 6 from here on. - It's possible to complete all remaining quests above before pushing on through the Green Maze. - Upon completion, you should now have 16-16-17-17 quests completed. - Save 50 Tropical Shell for (Master Trader Pants Recipe quest). - Save 27 Sausages for (Master Hunter Jacket Recipe quest). - Save 24 Large Toy Doll for (Master Hunter Hat Recipe quest). - Save 27 Peach Cakes for (Master Lumberjack Jacket Recipe quest). - Save 24 Carved Bust for (Master Lumberjack Hat Recipe quest). - Save 16 Marshall Boots for (Master Explorer Boots Recipe quest). - Pilgrim Hats should still be your main source of Chits. More info and other options can be found here: How to Get or Farm Fast Chits with Toys and Hats. - Welcome to the Lava Mountain, one of the longest trail that you will encounter (34 Camps). - You'll start to encounter Beavers here again, so pack some slings and farm crafting materials for your Pilgrim Hats! Start gathering Turkey Feathers too! - Back to Mesquite trees and Boars, if you like, just rush through this region to quickly reach the next region where you can start picking up Ice items for your quests. - Once you reach this region, you should now close on completing your "Master Lumberjack Gear Set Quests". - Collect and save another 60 pieces of Ice for you Master Explorer Helmet Recipe quest later on. 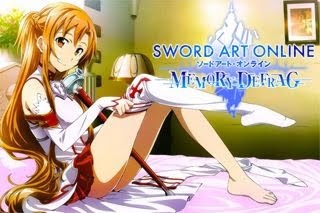 - You should now have completed all quests above once you reach the end of this region. If you need more, just continue to the next region, or buy from traders. - Once you reach the Green Way camp and ferry, you'll need 900,000 Chits! - If you have a total of -25% Gate Cost from furnitures, you'll just need 675,000 Chits, or 12 Favours. - Just continue and complete this region...and be ready for the crazy ferry fee~ LOL! - Try to upgrade your House to Lvl 10 to get a total of -60% Gate Cost. - For the upcoming regions, the strategy is pretty much the same, just continue and explore The Trail.